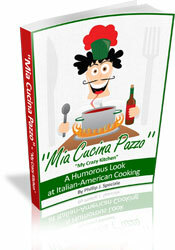 "Enjoy the food, enjoy the wine and reminisce about years gone by, share a laugh and shed a tear and enjoy the company that is dear"
To review the full table of contents and purchase "Mia Cucina Pazzo" just click here to take you to a great page. Melanzane Fritti by Antonietta Scanga from Salida,Co To see all the recipes visit “Mangia Italiano Summer 2009 Italian Recipe Contest”. To see all the recipes visit “Mangia Italiano Summer 2009 Italian Recipe Contest”.